Fig. 1, Worm untwisting. A. Twisted-up embryo. B. The same embryo after a lattice has been added, defining the coarse 3D shape. C. The same embryo after the worm model has been refined. D. The embryo after untwisting. 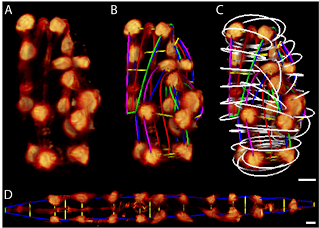 Muscular twitching during the latter half of embryogenesis introduces key imaging and analysis challenges. We address these challenges by developing software that untwists the worm (1). Images of a worm strain expressing fluorescent markers in specific cells are captured on the diSPIM. Using these markers, the shape of the embryo within the eggshell is modeled computationally. This model is used to resample and linearize the volume (Fig. 1). Once linearized, multiple volumes are effectively put in the same reference frame, allowing data from multiple images, or even multiple embryos, to be combined or compared.